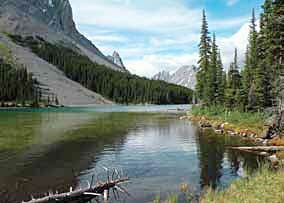 Lakes abound in the limestone high country of Kananaskis. Many are set in remote valleys. This well-beaten path through forest and meadows leads to a beautiful tarn in a more open setting. It’s a great hike for birding and for botany. The wild flower displays of early summer can be superb, especially the blooms of glacier lilies near the lake. Two lakes bookend this outing; one a massive reservoir, the other a jade gem nestled in a deep limestone pocket. 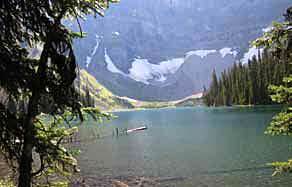 Between them you climb through a tract of dense subalpine forest. Split log boardwalks span wet areas as you near the lake shore. Snow sometimes lingers until mid-July – which makes this a great place for wildflowers that prefer the cool and damp: white globeflower, alpine but-tercup, and evergreen violet. Mt. Sarrail (3174 m) is the backdrop at the lake. Elbow Pass is a gentle break in the ragged limestone wall on the east side of the Kananaskis Valley. The road-width trail makes a quick ascent, crossing the pass to where you make the circuit of Elbow Lake. Mt. Rae (3225 m), named for a 19th century Arctic explorer, rises to the southwest. Listen for the calls of all three of the Rockies’ thrush species: Swainson’s thrush, hermit thrush, and varied thrush. You may also hear white-crowned sparrows and yellow-rumped warblers. 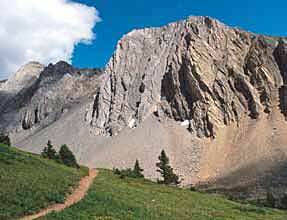 Ptarmigan Cirque is a miniature version of hundreds of other glacial valleys in the Rockies. Plants and animals cling tenaciously to life; the hallmark of ice is every-where. The bedrock reveals the fossilized remains of lifeforms that lived in ancient seas. 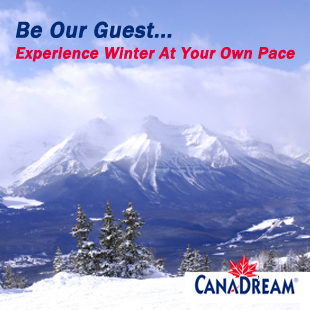 Walk north from the parking area on a wide, gravelled path through Highwood Meadows. Look for bighorn sheep. 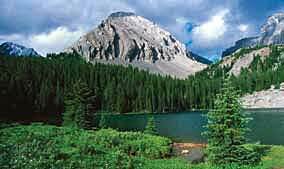 Cross Highway 40 and climb through an up-per subalpine forest of spruce, fir, and larch. Snowcover, wind, and temperature, limit and sculpt the vegetation at treeline. Areas of permafrost underlie some of the meadows. A cirque is a bowl-shaped valley eroded by a glacier. The white tailed ptarmigan (‘TAR-mih-gan’) is a ground-dwelling grouse-like bird. Its feathers change colour from mottled brown, gray, and black in summer; to white in winter. Graeme Pole is a local avid hiker and author of excellent guide books, as well as a contributor to this website and Experience The Mountain Parks printed guide.